Location, location, location! 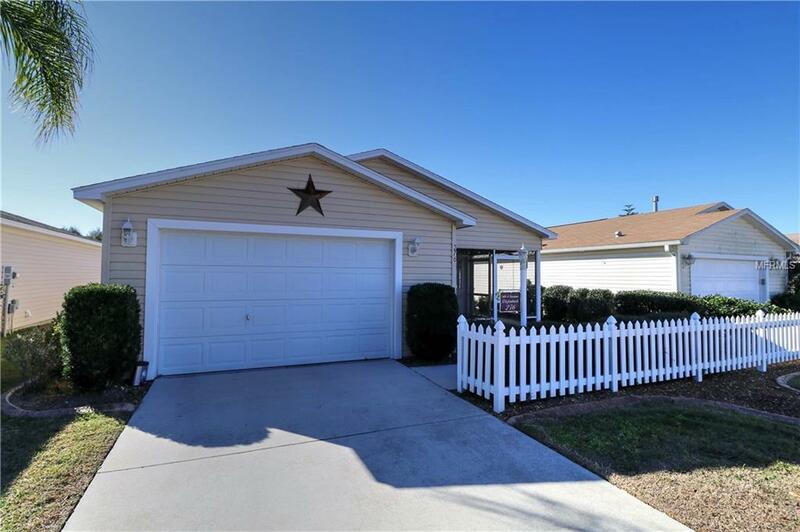 Nestled in the very desirable Village of Caroline, this inviting & beautifully maintained Colony Patio Villa is only minutes from Sumter Landing. Whether you are a snowbird looking for your first Villages home, or a Villager who wants to be in the heart of Florida's Friendliest Hometown, this villa might be perfect for you! The open and inviting floor plan features beautiful laminate flooring in the living room and dining room. Upgraded ceiling fans and light fixtures brighten every room. The vaulted ceilings and carefully selected colors lend to the spacious feeling. The kitchen features a gas range, as well as a great snack bar where guests can gather. Handy built-in cabinets in the garage provide extra storage space. A screened front lanai is the perfect place to enjoy morning coffee or visit with friends, and there's plenty of space on the side patio to grill or just enjoy the fresh air. Pride of ownership is apparent everywhere in this home!